INTRODUCING THE OMEGA SPEEDMASTER "PORSCHE CLUB OF AMERICA" LIMITED EDITION. We are proud to announce an amazing PCA creative project with the prestigious Swiss watchmaker OMEGA which has resulted in a Limited Edition collection of 99 unique and very rare timepieces. The OMEGA Speedmaster "Porsche Club of America" Limited Edition combines OMEGA’s most advanced innovation with the PCA’s expert motoring knowledge, and wonderfully pays tribute to the famous sports car as well as the world of speed. This ultra limited timepiece will be available for $12,911. A well-known color scheme for performance car enthusiasts. The OMEGA Speedmaster may now be an icon of space exploration as well as being the first watch ever worn on the moon, but it was originally intended for racing car drivers to time their laps when it was first released in 1957. 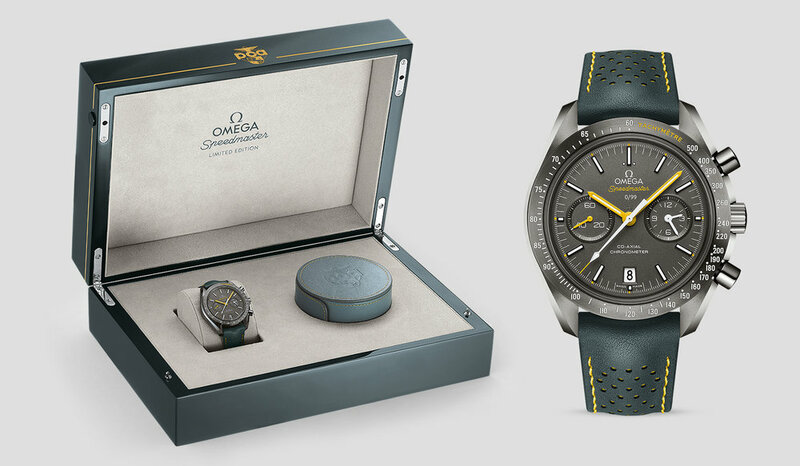 The grey ceramic case of the OMEGA Speedmaster "Porsche Club of America" Limited Edition has been used to advantage for this special edition; it is no accident that it looks remarkably like high-performance brakes of sports cars, where the brake disks are made of grey ceramic and the visible calipers are yellow, a color scheme generously echoed on this limited edition. The watch features a 44.25 mm case made from polished and brushed grey ceramic with an exclusive plasma treatment. Some of the hands and other details, such as the tachymetre wording, appear in yellow. The watch also includes a ceramised Grade 5 titanium dial, a material found in abundance on the moon, as well as in the exhaust design of the Porsche 911 Turbo, where it helps give this already outstanding car a further step in performance. The hands appear in white and yellow. The Porsche Club of America logo appears in yellow on the sapphire-crystal caseback. The driving force is the automatic winding OMEGA Co-Axial Calibre 9300, a superb movement that can be found behind the sapphire-crystal caseback. Around the wrist, the watch comes presented on a driver-style grey leather strap with micro-perforations that reveal an interior made from yellow rubber.